Omnivore | It's what I eat! For reasons relating to jet lag we still have not made it to the grocery store for a general re-stock shop. I am running out of dinners to make using what is left in the pantry and fridge. Luckily I have two carrots, an onion, garlic, some very bendy celery, and a small head of cabbage still remaining. I combine these with some stock (vegetable or chicken), a can of white beans, and optional Parmesan rinds. Sauté the veg then add the beans, cabbage, rinds, and stock. Simmer for twenty minutes or so. I dress up the top with parsley and a good olive oil. It’s a combination that can be vegan, vegetarian, or omnivore. How you dole it out makes it either a stew or a soup. 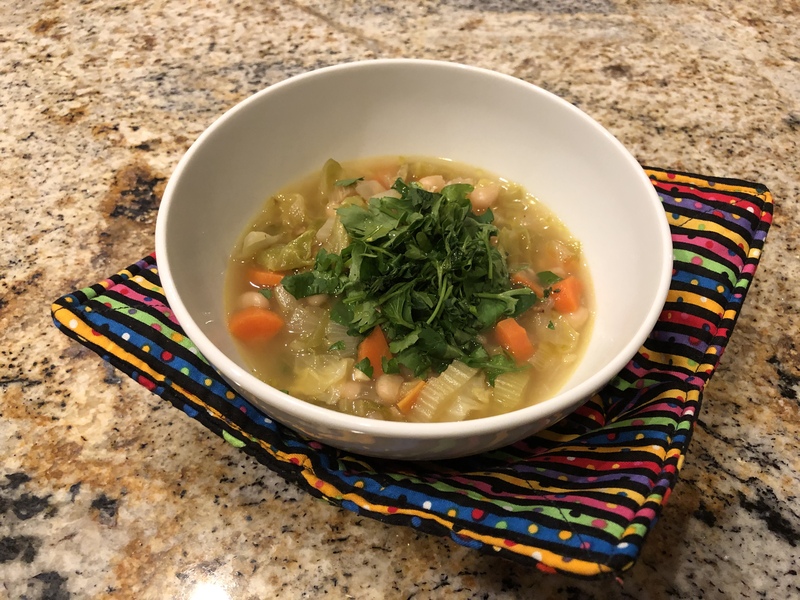 I like one bowl of stew heavy on the vegetables and light on the broth. John prefers two bowlsful of a much soupier mixture. If I had remembered to take a picture of our dinner last night it would have looked something like this. 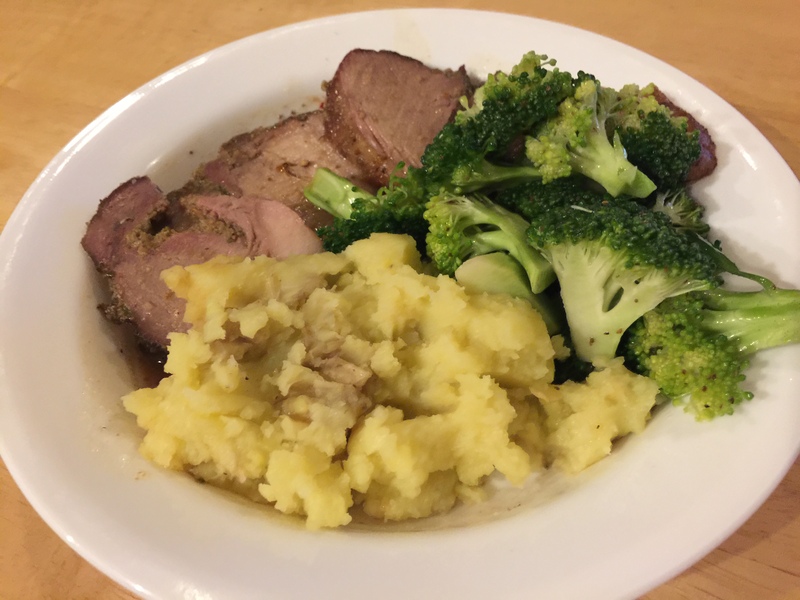 The difference is that John sous vide two racks of lamb instead of boneless leg of lamb. He set the water temperature at 136F and they cooked to a lovely rosy pink. They were in the water bath for about three hours. He then did a quick grill. Unfortunately the grill flared up and the beautiful double chops came out somewhat black. They were still nice and pink inside but lost some of their visual appeal. 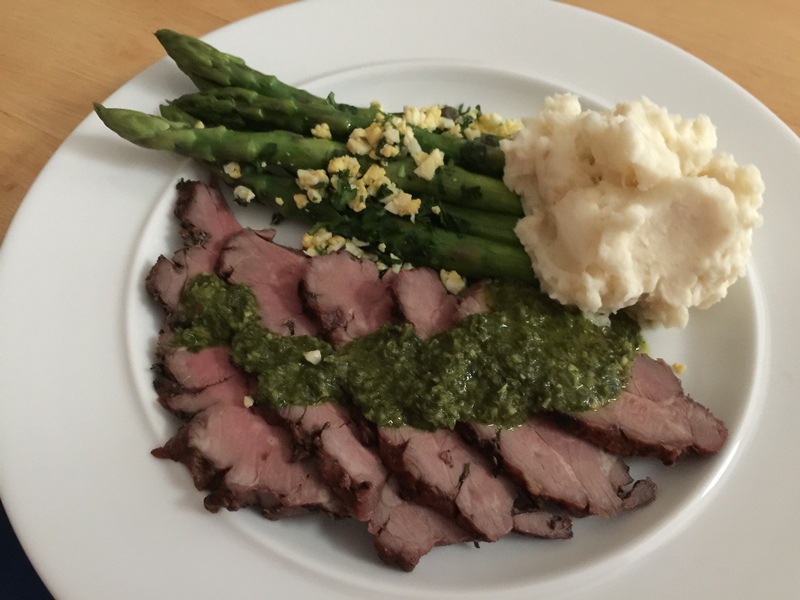 We served them with a chimichurri sauce. I made mashed potatoes and asparagus with crumbled egg just as shown in the picture. We had this for company. Why is it we can make dinner for ourselves and it goes without a hitch but when we try it for company invariably something goes wrong! We got back from our trip yesterday and I am ready to get cooking again! John and I each gained about 4 lbs. eating our way across the Atlantic, Spain, and France. We are going to work on this weight gain by adopting a more Mediterranean diet mindset. 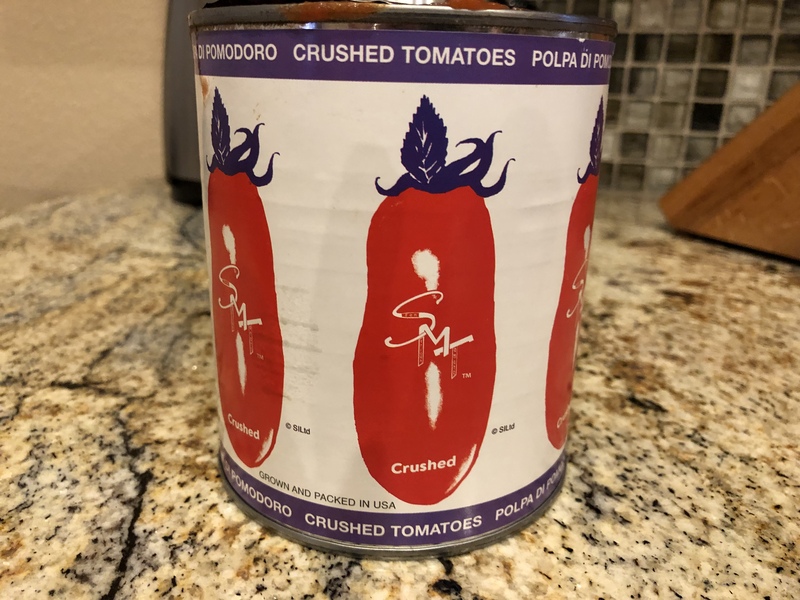 Tonight’s dinner is whole wheat spaghetti with a quick sauce of San Marzano tomatoes, garlic, onions, capers, and olives. 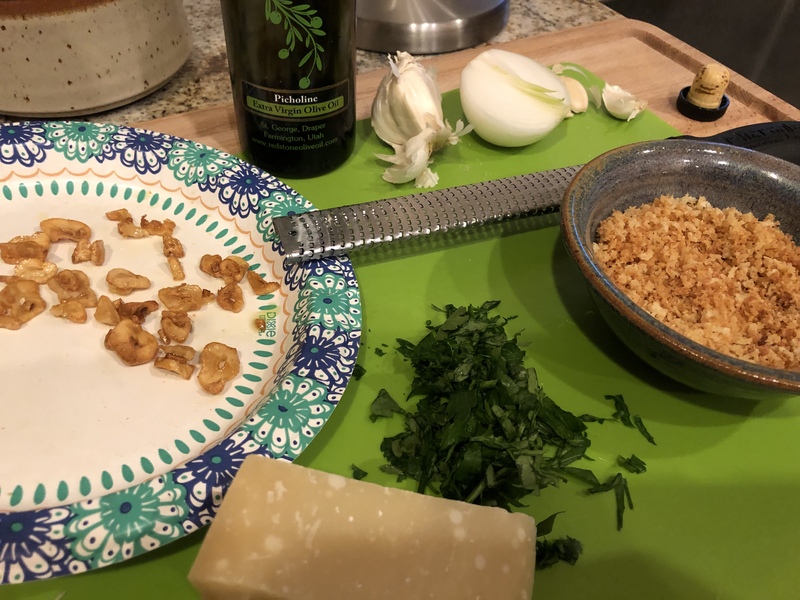 I garnish mine with chopped parsley and toasted breadcrumbs while John also adds Parmesan cheese and a finishing olive oil. After toasting some garlic slices and breadcrumbs along with chopping up some parsley I set those aside for the finished dish. 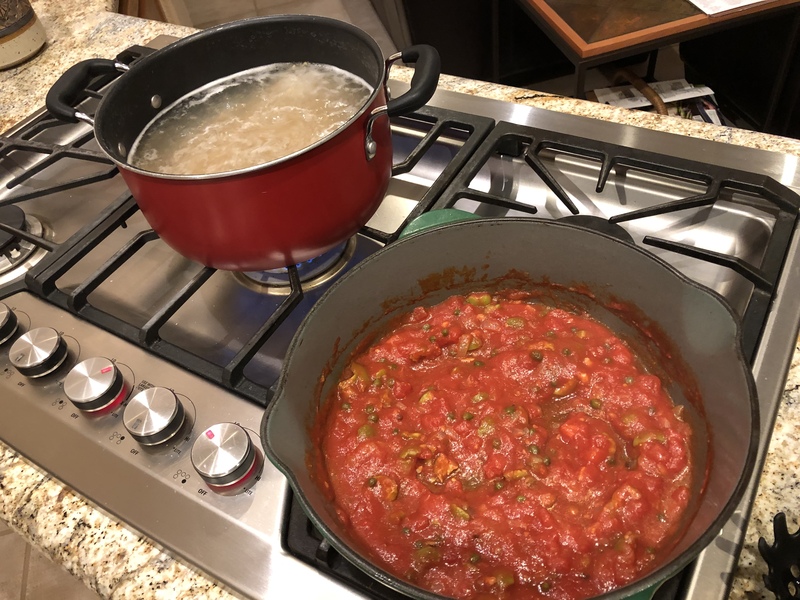 In the time that it takes John to bring the water to a boil and cook the pasta, I make the sauce. It is just a quick sauté of garlic, onions, and pepper flakes, then add the tomatoes, olives, and capers. Don’t add salt to the sauce! The capers and olives take care of the needed salt. I adjust the flavor with a pinch of sugar. Be sure to save a cup of pasta water to thin out the sauce before you toss the drained spaghetti into the sauce. 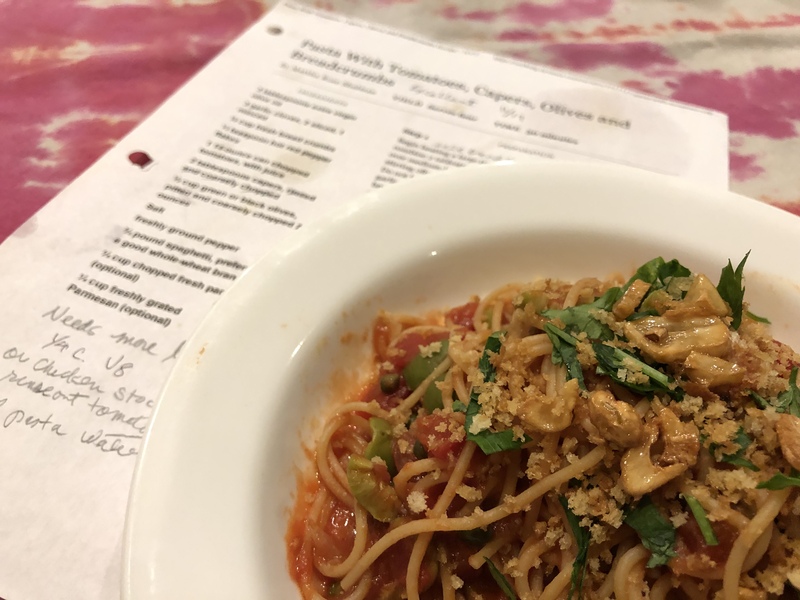 This great vegan dinner is my adaptation of a NY Times Cooking recipe. It is quick, easy, inexpensive, and totally delicious! We are coming home tomorrow and I will be so glad to get back in the kitchen! I have picked up a few ideas while away that I will be hoping to incorporate into my cooking. 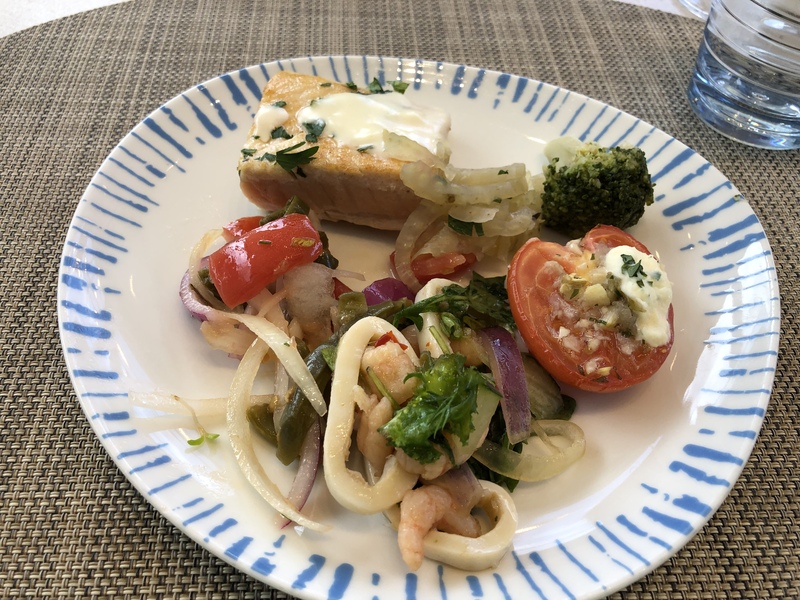 One idea is generally to follow a more Mediterranean diet. 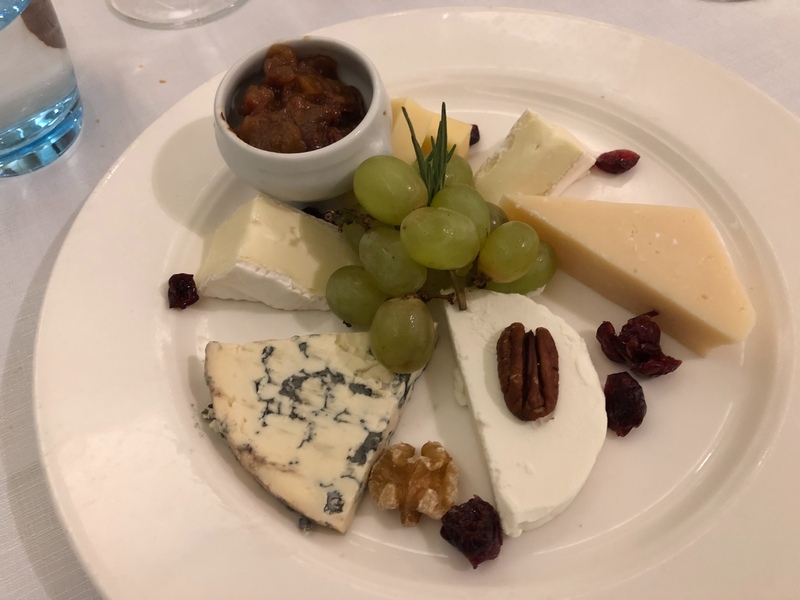 We were regaled with health statistics by our Spanish guide who credited the Med diet for a great increase in longevity in Spain. He said the keys are eating fish and shellfish, lots of vegetables, cooking and dressing with olive oil, and keeping meats to chicken and rabbit. Sounds good to me! 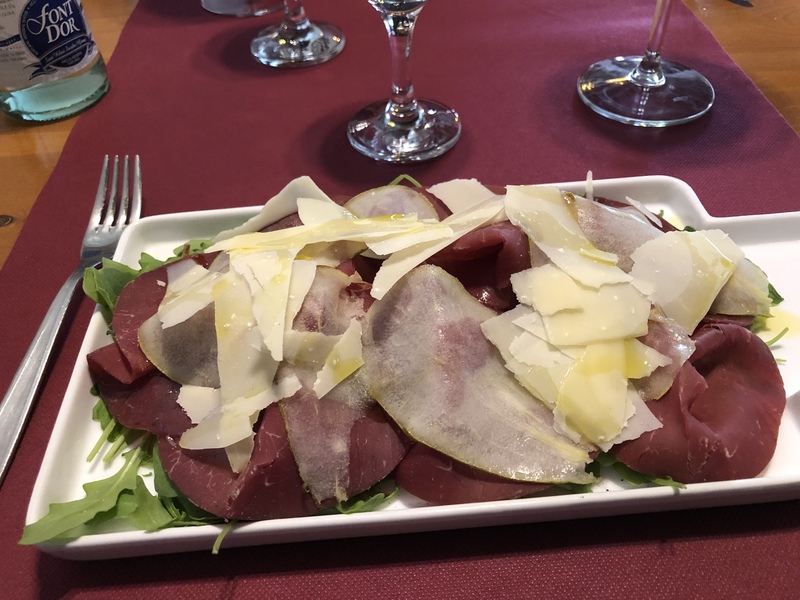 I had a carpaccio (really more like salted, cured meat)with arugula and shaved Parmesan that also had finely sliced pear in it. While the meat was a little overwhelming, I can imagine this salad as arugula, Parmesan, and pear. The juicy, sweet pear really added another dimension to my dish. I have been a little derelict with posting to my Omnivore site while we have been on vacation. This is partly due to the fact that I am busy writing my travel/personal blog every day and partly because I am lazy. Sorry. Anyway, for lunch today they had porchetta and it reminded me of the feeble attempt that we made just before Christmas, 2017. A porchetta is a pork loin book cut so it is a large rectangular, thin piece of meat. It is rubbed with a garlic/fennel mixture, rolled up and tied. We cooked our low and slow. This is what it looked when sliced. So it did not come so great. It was a little dry and it had been hard to roll up so there wasn’t any pretty spiral. 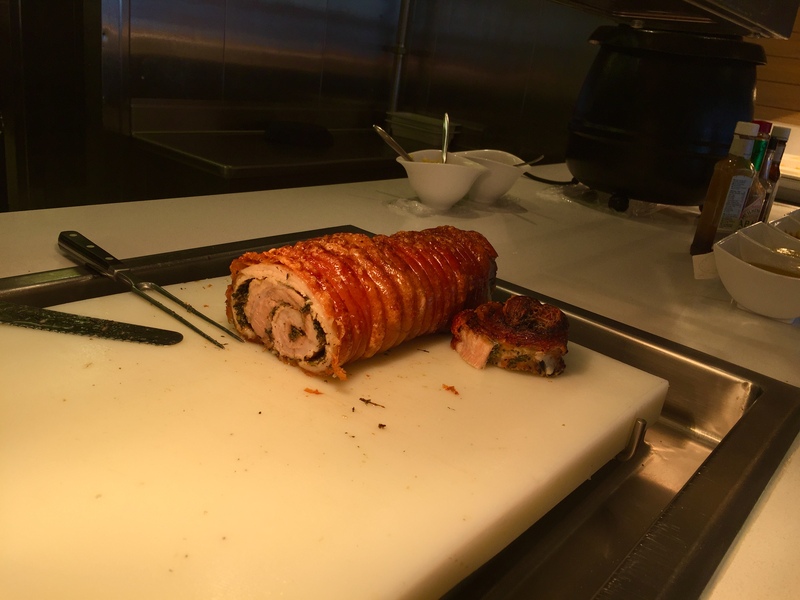 No wonder John was awe struck when he saw the beautiful porchetta made by the chefs on the ship. He definitely has porchetta envy.